Rachelle J. Christensen is the bestselling and award-winning author of more than ten books. Her first suspense novel, Wrong Number, was a Whitney Award finalist and was awarded the Outstanding Book of Year award from the League of Utah Writers. 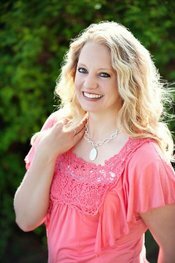 She also writes romances and nonfiction, with titles that include The Soldier’s Bride, Carve Me a Melody (Music Box Romance series); How to Fetch a Fiancé, Hawaiian Masquerade (Destination Billionaire Romance series); Diamond Rings are Deadly Things, Veils and Vengeance, Proposals and Poison (The Wedding Planner Mystery series); Silver Cascade Secrets, Double Take (Silver Cascade Suspense series); River Whispers, Caller ID, Lost Children: Coping with Miscarriage for Latter-day Saints, and What Every 6th Grader Needs to Know. With her husband she wrote Ultimate Life: Create a Life Worth Living in 9 Simple Steps. She contributed to the anthologies including Autumn Collection, and the Echo Ridge Anthologies, which include Christmas Kisses, Kisses Between the Lines, Silver Screen Kisses, and Second Chance Kisses. Christensen was born in Rupert, Idaho. She earned her bachelor’s degree in psychology from Utah State University. She and her husband, Steve, are the parents of five children. She is a member of The Church of Jesus Christ of Latter-day Saints. This page was last edited on 27 November 2017, at 15:31.